Last week, Unison members in the Meat Hygiene Service – 1,000 out of 1400 frontline meat inspectors – voted to go on strike over pay and working patterns. On Monday, a union meeting decided to hold three days of strike action in early December. The inspectors work in England, Scotland and Wales and have sole responsibility for inspecting red meat and, where it’s not deregulated, poultry and game. News alert! Christmas dinners in danger! I duly wrote up the story. Just as I was doing so this afternoon, the phone rang. It was the Meat Hygiene Service; did I know that the strike had been called off? Oh. One instant Unison press release later, it was time to rewrite the story. Oh well, can’t be that hard. (This post comes in two parts: Part 1 deals with The Fight and Part Two with The Merger). “I guess the election will go ahead, and Derek will win,” the Unite insider said with a facial shrug of the shoulders as I quaffed diet coke (I was trying to cut calories) during a private, after-hours chat in a pub the other week. He was right. After all, at the time Derek Simpson was only being challenged for his job being co-leader of Britain’s biggest union (see below) by Jerry Hicks – branded a destructive “Trot” by his enemies to the right of him, and who has not sought to reach out to left groups in the union – and Laurence Faircloth. Neither had apparently attracted a broad base of support. The ballots would go out and most people would tick the box next to the most familiar name. Anyway, never mind all that. The point is – with five candidates, the ordinary member is now likely to start asking questions about why so many people are standing. And in particular why the latest contender, Paul Reuter (no website, says he doesn’t need one) is doing so despite being a national secretary and therefore (one might think) having his head firmly screwed on, so to speak. All of which must leave Simpson a little rattled, especially judging by his reaction to one candidacy. Meanwhile, the union machine that could normally be relied on to defend the leader is not firing on all cylinders: one Simpson’s key aides, national political director Charlie Whelan, is facing serious grievance procedures from his own political department, as The Times reports. And in case anyone thinks Faircloth is now the frontrunner, there’s a good old lefty argument going on about whether they should have nominated him at all. What does this matter? Eight million pounds, for a start. That’s the size of Unite’s political fund, and it’s set to get bigger. The union is gearing up on a national level to help Labour win the next election. It will provide canvassers, cold-callers and of course hard cash, and while Whelan is in post it will back Brown to the hilt. Jerry Hicks and, to an extent, Laurence Faircloth threaten this: Hicks is an ex-SWP and current Respect Renewal (pro-Galloway) member, while Faircloth, though a Labour man, is not shy of saying that the government has disappointed unions. More importantly he’s been quoted as saying: “It’s time to end the practice of giving the national Labour Party millions of pounds every year with no strings attached”. If there is going to be an early election, that’s money the party needs more than ever. Douglas Alexander, Labour’s election co-ordinator, must be watching. Meanwhile, Unite’s merger remains incomplete. You have to ask why. It’s true that the election for general secreatary forced the Amicus section to put back the formal merger till May, but that’s really not the point. Until October’s executive meeting, Unite was supposed to become one indivisible entity this month. Yet many important structures are not inplace, as Simpson partly acknowledges in his memo. The voluntary redundancy programme for union staff hasn’t been completed and, perhaps most importantly, the finance department hasn’t been merged. Most visibly of all though, Unite’s website (pictured) remains a bit of a shell. Apart from press releases, a list of campaigns and video clips from the union’s Internet TV channel, there’s not a lot there. Many links take you over to the separate and fully-formed T&G and Amicus websites – which, interestingly, are still being kept bang up to date, including copies of all the press releases on the Unite website. It’s already a matter of public record that Simpson’s opposite number, Unite T&G general secretary Tony Woodley, is saying that some people are deliberately holding up the merger. If external appearances are anything to go by, they’re pretty good at it. If I were Unite’s webmaster, I’d be either (a) thoroughly ashamed of myself or (b) thoroughly pleased at my success in holding up the merger, depending on where I stood. Where next for Royal Mail? First of all, if you’re in a hurry, I advise you to skip this blog and go straight to this article on the ever-interesting postal news website Hellmail, for a great no-nonsense analysis of the problem Royal Mail is in. Otherwise, please tarry awhile beside my humble words. It’s been an interesting couple of weeks in the postal sector. First James Purnell announces that the Post Office can keep its card account and what’s more competitive tendering is off the menu (for now); then regulator Postcomm says the Post Office should be broken off from Royal Mail Group; then I go and tell all this to Lindsay Hoyle, MP and member of the Business and Enterprise Select Committee, who immediately (and without prompting) demands an inquiry into Postcomm for (as he sees it) threatening Royal Mail’s future in this way – as reported in Tribune yesterday. Meanwhile, down at Westminster my lord Mandelson is making positive noises about Royal Mail developing more financial products, much in the mould of Jon Cruddas’ and Billy Hayes’ demands for a People’s Bank of the Post Office. While up north-west, Hayes’ members are being balloted for strike action over a long-running bone of contention: the closure and reorganistation of mail sorting centres leading to job losses. Oh, and the Hooper review into competition in the postal sector (translation: Royal Mail’s future) still hasn’t reported yet. There has been speculation as to whether Mandelson, for whose gracious consideration it is submitted, is sitting on it. Where does this leave Royal Mail? I think an alien flying down on a spaceship and surveying the situation would say “nowhere in particular”. As the Hellmail article points out, Royal Mail is facing some difficult pressure. It has to maintain the universal service obligation, while its commercial rivals don’t. The USO demands goverment subsidy, but tax cuts are the order of the day. Royal Mail is trying to become more lean and mean through streamlining its sorting processes, which angers the unions. And there’s a government-funded regulator, Postcomm, whose very job is ensure Royal Mail faces healthy competition. Competition which Hooper is unlikely to do anything to dampen. So I think people who think that the Government is about to clasp Royal Mail to its bosom and promise to look after it come hell or high water in a Keynesian sprit of public munificence should hold their breaths. Royal Mail and the Post Office have been going down the road of competitiveness and streamlining for about eight years, and there a no signs of a U-turn on that. But if there were, a Select Committee inquiry into Postcomm (see above) might well be the first step. Tribune will be happy. So will the Communication Workers’ Union, the National Federation of Sub-Postmasters, the Federation of Small Businessses, backbench Labour MPs and quite a few frontbench ones too. Today’s announcement by James Purnell (pictured), the sometime sideburn-wearing Work and Pensions Secretary, that the Post Office will keep the successor to the card account guarantees it £1 billion over five years and, apparently, safeguard 3000 post offices previously threatened with closure. I’ll come back to Mr Purnell and the political issues in a minute. But what does the decision to short-circuit the competitive tendering process mean for the Post Office network and its parent company, Royal Mail Group? It doesn’t mean that Royal Mail won’t be fully or partly privatised. Royal Mail Group as a whole turns a profit; the Post Office loses money. If you believe postal minister Pat McFadden, it loses £3.5 million a week – slightly more than the £150 million subsidy it receives from government. Moreover, Richard Hooper’s review into competition in the postal sector has yet to be published, and it’s expected to recommend some sort of joint venture with a private company. The postal sector is officially open to competition; that’s not likely to change. Nor does this leave the Post Office in good health. The contract is a renewal of an existing one, and the £1 billion won’t kick in till the old contract expires in 2010. So it’s not extra money. Meanwhile, post offices continue to be shut in a closure programme affecting 2500 branches. While the Government is apparently happy to talk about protecting the Post Office in the current economic climate, it doesn’t believe in subsidy at any cost. The status quo, as Hooper said, is not an option. Now for the politics. It was in December 2006 that the then DTI announced a bidding war for the new Post Office card account. The press release at the time put a really upbeat spin on it, but there’s no disguising the fact that, rightly or wrongly, it was exposing one more piece of the state-owned enterprise to market forces. Even then, ministers knew at least 2,500 post offices would shut. Losing POCA would mean more. What’s changed? Partly, as Purnell admitted, it’s the economic crisis. Enough people are losing jobs without adding thousands of sub-postmasters to the equation – not to mention the other small businesses that will suffer from the erosion of communities. Lord Mandelson’s recent suggestion that the Post Office to step into the breach to offer financial and other services by trading on its trsuted brand name was a suprising thing for such a Blairite to say about a public corporation – and music to Labour ears. Purnell, also seen as Blairite, must have taken note. But partly – like the 10p tax debacle – it’s sheer embarassment. On the Today programme this Monday morning, Conservative MP and Business and Enterprise Select Committee chair Peter Luff said how inexplicable it was that the Government was taking so long to announce the award of the POCA contract. It was supposed to be early this year, he said, and November isn’t early. Wasn’t it harmful for the Government to take so long he was asked. I am not the government, Mr Luff politely replied. But yes. He added that the thousands of closures if the Post Office lost POCA were just plain wrong. Could a Labour MP have put it any differently? Ears may have turned red at No 10, and not for the first time. For more than a year now, the POCA has been, as Sir Humphrey would say, rattling round Whitehall like a grendae with the pin out. Give it to the Post Office and its commercial rival PayPoint might challenge the decision in court as it may still. Give it to PayPoint and you could have another 10p tax situation. Purnell cannot have been looking forward to this decision. His announcement today puts the best possible gloss on it, as you’d expect from such a suave and intelligent minister. But if I were him, I’d be feeling that I’d been dealt a very poor hand. How Purnell deals with this, and all those unemployed people, remains to be seen. Should be interesting to watch. Update: Tom Miller reminds us that Lord Mandelson’s remarks about the Post Office are eerily close to Jon Cruddas’ recent Guardian column calling for the Post Ofice to become the People’s Bank. The Communication Workers’ Union’s Billy Hayes has said much the same thing in Tribune. In fact, Cruddas’ column was actually ghosted by the CWU. Mandy and Billy Hayes on the same page? Whatever next? Update no. 2, 8:18pm: Jon Craig at Sky News is calling this a triumph for the “sideburned schmoozer” (sound familiar?) Hardly suprising that Lindsay Hoyle cheered Purnell’s Commons statement; he was one of very few MPs on the Business and Enterprise Committee to rasie the subject of Royal Mail when Mandelson made his debut appearance before them last month. He’s also a staunch union man. As the world waits for the US to vote, we at Tribune have pounced on the early results from the towns of Dixville Notch and Hart’s Location, where Barack Obama has won by a convincing 15-6 and 17-10 respectively (and the second town, if not both, on a 100% turnout). 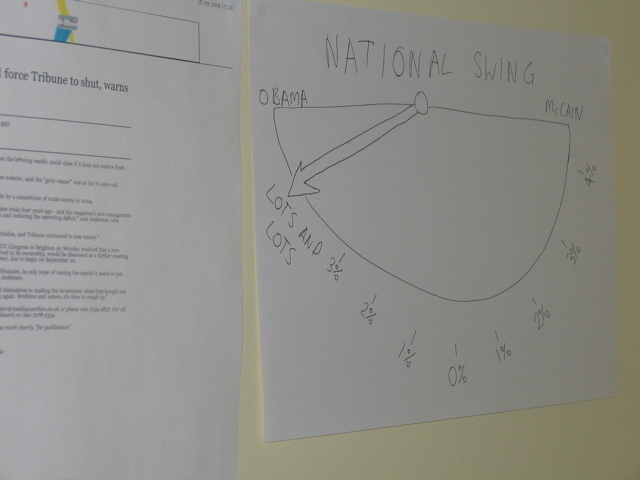 With some psephological number crunching too scientific to explian, we make that a swing to Obama of, ooh, lots and lots. Exit polls? Phooey. We called it first. N.B. The swing expressed above is not endorsed by Tribune, Gallup, Reuters or indeed anyone including myself.